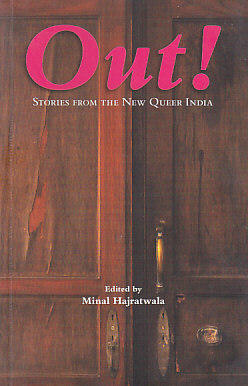 These are the lives of queer Indians today: poignant, gripping, and occasionally even hilarious, told through original and unforgettable stories, penned by the community’s master storytellers as well as emerging writers. Categories: Fiction, Gender, Literature. Tags: 9788192279305, Gay writing in India, Indian fiction in English, Lesbian writing in India, LGBT, Queer writing in India. In Bengalaru, a law student falls in love as the nation’s highest courts decide whether his love is legitimate. In Mumbai, a film star and a parent discuss their own journeys of “coming out” as advocates of the lesbian, gay, bisexual, and transgender movement. In rural Kerala, two girls row a small boat and feel their hearts opening. Out! Stories from the New Queer India offers a glimpse beyond the closet doors – and into the lives and dreams of India’s most misunderstood minority. Editor Minal Hajratwala is the author of Leaving India: My Family’s Journey From Five Villages to Five Continents (2009), which was called “incomparable” by the Pulitzer Prize–winning author Alice Walker and “searingly honest” by The Washington Post. The book won a Pen USA Award, an Asian American Writers Workshop Award, a Lambda Literary Award, and a California Book Award, and was shortlisted for the Saroyan International Writing Prize.